Okay, I know what you’re thinking: “What is this? 5 Obvious Things About my Phone as Told by a Stranger on the Internet?” But hear me out. As the cameras on smart phones progress, the line between professional and amateur filmmaking begins to blur. There are award-winning movies shot with IPhones that challenge our expectations for how movies should be made. Practice makes perfect, and we can all agree that taking pictures and videos is something that everyone is doing…all of the time. As we constantly capture what we see through our iPhones, our eyes and minds begin to see the world through a frame. This exercise of framing images in a compelling way will help you grow as a visual storyteller. So go ahead, snap a pic of your baby cousin, record that sweet shot of the turkey being carved and start using the phone camera to make yourself a better filmmaker! Adobe Capture is a powerful little app and a must-have for aspiring filmmakers. 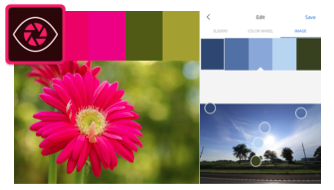 The program allows you to turn your own photos into themes, patterns, and typeface, but for now, we’re going to focus on the Color Palette feature. Have you ever been inspired by the look and feel of something in your daily life? (You’re a filmmaker so I will assume you have.) This app allows you to hold onto those moments and save the color palette of an image. A color palette has the potential to bolster the storytelling power of your visuals, when used purposefully. Not only will this app give you a set of color palettes to use in future projects, but it will also train your eye to look at a scene and assess the colors through the eyes of a filmmaker. Tip: The app will automatically place the points from which it picks colors, but don’t be afraid to move these around to see what colors you may like better. 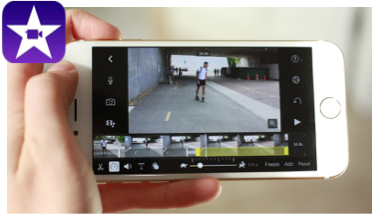 Another staple of mobile filmmaking is iMovie, a user-friendly editing software in the palm of your hand. iMovie doesn’t have the capacity to edit together a two hour feature, but the simplicity and accessibility makes editing small projects possible. With iMovie, you have the ability to cut together footage, apply transitions, edit audio, create split-screen shots, and overlay text. Learning the basics of editing will allow you to think like an editor when writing, shooting, and directing. Cameras capture movies, but editors bring them to life. Boost your social capital by editing together a montage of your trip to Europe during the holidays. Show off your cooking skills with a quick How To video on making the best sweet potato casserole. Make your family relive the disaster that was Thanksgiving 2016, and throw together a quick recap to show this year. Whatever you shoot, turn it into a coherent story with the magic of editing. Tip: If you’re too lazy to record video or don’t know where to start, try making a fun slideshow with iMovie using still photos. Learning Curve: Usable by beginners, but many features will require practice or tutorials. Natural light is a fantastic tool for filmmakers because it looks better than standard lighting...and it’s FREE. The magic hour refers to the period of time right after sunrise and right before sunset when the sun bathes everything in a soft warm light that looks beautiful on camera. Magic Hour is a simple but extremely useful app that tracks when magic hour begins and ends, based on your location. The app will even send you notifications when magic hour is approaching! We’ve all experienced the beauty of a great sunset. Now it’s time to learn how to capture the magic! Tip: Don't forget to give yourself time to set up. Magic hour moves quickly! Learning Curve: Very easy to use the app but using the light effectively may take some practice. Reading books makes you a better writer, but reading scripts makes you a better filmmaker. 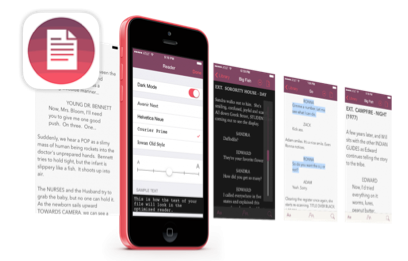 Weekend Read puts a large library of both good and bad scripts right on your phone, in an easy-to-read format. Even if you don’t like writing, reading scripts and understanding how visuals, action, and dialogue work together will make you a better visual storyteller. Your movie can look beautiful, but if you don’t have a good story, none of that matters. So take a break from liking and sharing your life away, read a script and take the next step to becoming a filmmaker. Tip: Read a script, then watch the movie. See what changed, how the words sound in practice, and imagine what you may have done differently. Learning Curve: If you can read, you can read scripts. Do it! Want to see what you can accomplish when you master the iPhone as a filmmaking tool?